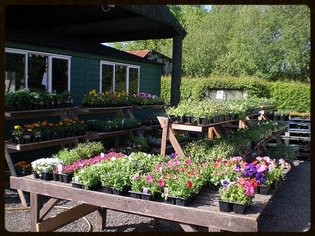 Although our main business is the growing and harvesting of turf and the supply of good quality topsoil, we offer the following products throughout the gardening season. Soil and compost remineraliser - adds essential MINERALS AND TRACE ELEMENTS to help grow healthy plants, invigorate composting and as a tonic for wormeries. * IN DECLINE: Minerals and Trace Elements are the smallest of soil and compost's five components. They make up a tiny percentage of each harvest yet most plant foods only replace a few of these, in limited amounts. The Minerals and Trace Elements in REMIN are also well documented as being in decline. * VOLCANIC FERTILITY: Volcanic soil, ie soil close to a volcano, is often very fertile. This is because of the rich supply of Minerals and Trace Elements in the volcanic rock. Over millenia it is ground down and spread by glaciers. 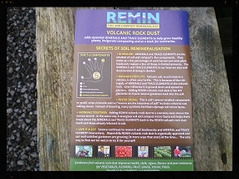 Adding REMIN volcanic rock dust is like DIY glaciation ie it puts natural goodness back into the soil. 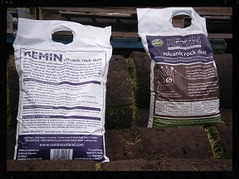 *GIVE IT A GO: REMIN Volcanic Rock Dust is organically approved and gardeners are well satisfied after using it... The only way to find out - is to try it for yourself ! !